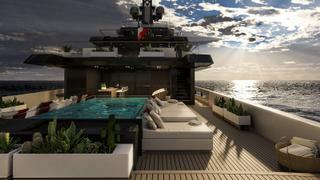 Italian yard Viareggio Superyachts has revealed new details and renderings of its 67 metre explorer yacht concept developed in collaboration with Hot Lab. Revealed at last year's Fort Lauderdale International Boat Show, the steel and aluminium 1130GT yacht will feature naval architecture by VSP and Marin and engineering by VSY. Exterior and interior design meanwhile has been undertaken by Hot Lab. 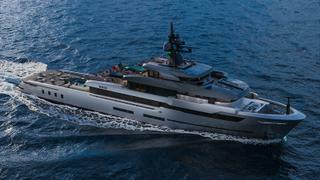 Michele Dragoni, design partner at Hot Lab, explained that the project was “built around a concept that is very faithful to the original explorer yacht concept”. Key examples of this include a classic bow design and a chunky superstructure, evoking rugged working boats and research vessels. Other key features include the main deck, the aft part of which has been left completely flush to the deck. Access to the beach club from the main deck is via a large hatch while a small panoramic sundeck resembling a "crow's nest" sits at the top of the superstructure, a nod to "the legendary age of sail". The aft deck meanwhile has been left open, allowing for a multitude of freestanding sunloungers and sofas. With no staircase built into the transom, the entire section can fold out to create a full-beam swimming platform adjacent to the superyacht beach club. 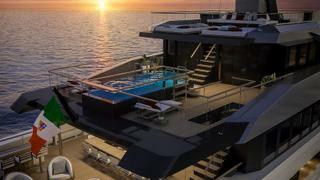 The upper deck features a glass-sided infinity pool. Moving inside and the interior décor is described as “fairly classic” with a choice of two layouts available featuring either a six-cabin or seven-cabin layout available. Hot Lab's Antonio Romano said. "The common denominator is represented by the presence of large windows on three of the four decks, which literally flood the interior with natural light." The upper deck owner’s suite will benefit from 180-degree views, his and hers bathrooms and a private study, while the skylounge boasts glazed windows on three sides. 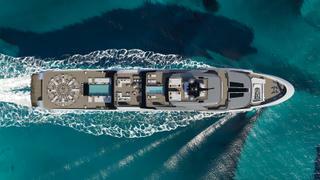 The yacht will have a maximum speed of 16 knots and range of 5,000 nautical miles at 12 knots.